Paul Warne has revealed how a text message signalled the end of Peter Odemwingie’s ill-fated stay at Rotherham United. 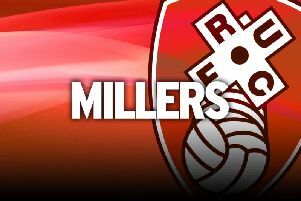 The attacker, whose short-term deal is due to expire on January 25, has decided to quit the Millers despite being offered a contract extension. Odemwingie, aged 35, signed a short-term deal when previous boss Kenny Jackett was in charge and has made just three starts and four substitute appearances. The former Premier League player was banned for three matches when he was red-carded for elbowing Liam Cooper against Leeds United in November and then pulled out of last week’s FA Cup tie against Oxford United when he was injured in the warm-up. Warne, whose beat Norwich City 2-1 on Saturday despite being hit by injuries and player departures, is hoping to start his recruitment in the January transfer window very shortly. He distanced himself from the controversy surrounding Dexter Blackstock after it was claimed the Rotherham striker is representing former Nottingham Forest teammate Henri Lansbury in a potential move away from the City Ground. FA rules prohibit a player from acting as an agent. “I haven’t spoken to Paul Douglas (chief executive officer) or Dexter about it,” Warne said. “I presume the FA and the football club will look into it. “If he has done something he is not supposed to do, there will be repercussions. I don’t think that it is my place as a caretaker manager to address it.